This species is accepted, and its native range is Azores, Europe to Mongolian and W. Himalaya. Endémica y nativa en Colombia; Alt. 3100 - 3750 m.; Andes. Naturalizada en Colombia; Alt. 2500 - 3500 m.; Andes. Perennial; caespitose. Culms erect, or geniculately ascending; 30-120 cm long; without nodal roots. Ligule an eciliate membrane; 1-2.5 mm long. Leaf-blades 6-40 cm long; 3-10 mm wide. Leaf-blade surface smooth, or scaberulous; rough adaxially. Inflorescence a panicle. 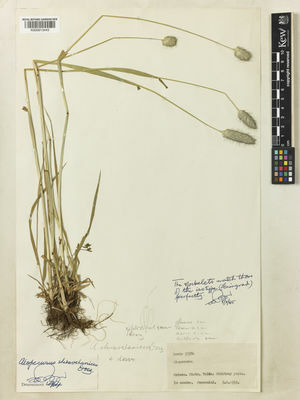 Panicle spiciform; linear; 2-13 cm long; 0.5-1 cm wide. Primary panicle branches accrescent to a central axis; with evident branchlets on axis. Panicle axis with rounded ribs. Spikelets solitary. Fertile spikelets pedicelled. Pedicels oblong. Spikelets comprising 1 fertile florets; without rhachilla extension. Spikelets elliptic, or oblong; laterally compressed; 4-6 mm long; falling entire. Glumes connate along margins below; similar; reaching apex of florets. Lower glume oblong; 4-6 mm long; 1 length of upper glume; membranous; 1-keeled; 3 -veined. Lower glume primary vein ciliate. Lower glume surface pubescent. Lower glume apex acute. Upper glume oblong; 4-6 mm long; 1 length of adjacent fertile lemma; membranous; 1-keeled; 3 -veined. Upper glume primary vein ciliate. Upper glume surface pubescent. Upper glume apex obtuse. Fertile lemma elliptic, or ovate; 4-6 mm long; membranous; keeled; 4 -veined. Lemma margins connate below. Lemma apex obtuse; awned; 1 -awned. Principal lemma awn dorsal; arising 0.2-0.3 way up back of lemma; 6-10 mm long overall; clearly exserted from spikelet. Palea absent or minute. Lodicules absent. Anthers 3; 2-3.5 mm long. Stigmas protogynous; terminally exserted; pubescent. Ovary glabrous. Caryopsis with adherent pericarp. Hilum punctiform. Disseminule comprising a spikelet. Europe: northern, central, southwestern, southeastern, and eastern. Africa: north and Macaronesia. Asia-temperate: Siberia, Soviet far east, Soviet Middle Asia, Caucasus, western Asia, China, Mongolia, and eastern Asia. Asia-tropical: India. Australasia: Australia and New Zealand. North America: Subarctic, western Canada, eastern Canada, northwest USA, north-central USA, northeast USA, and southeast USA. South America: western South America and southern South America. Glumes connate only at base. Akhter, C. & al. (2016). Alopecurus pratensis (Poaceae), a new record for the Indian subcontinent from Kashmir himalaya Rheedea 26: 52-53.